An international cement company Lafarge, winner of a Green Initiative award, is considering quarrying a cave in Malaysia which is the sole home of a critically endangered species. The proposed operations also threaten a Buddhist monastery near the cave where monks are facing eviction. 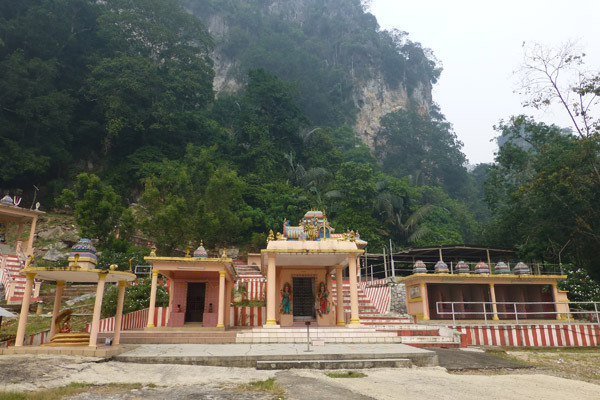 Kanthan cave in Peninsular Malaysia is located in a limestone hill, already extensively quarried for the production of cement by Lafarge. 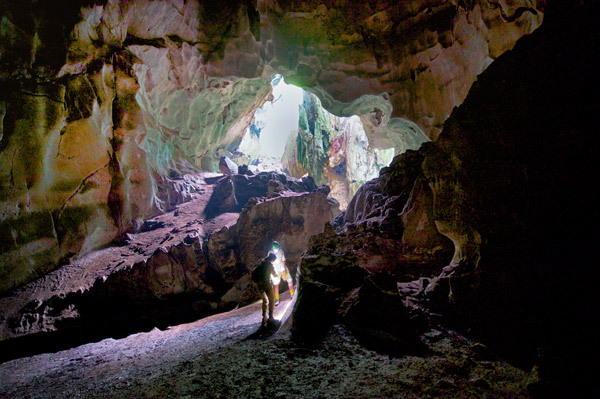 The cave, just as most karst caves in Southeast Asia, harbors a unique ecosystem. One of the rare endemic organisms is the Kanthan Cave trapdoor spider (Liphistius kanthan), which was just designated as Critically Endangered by the IUCN Red List. It is found nowhere else in the world. 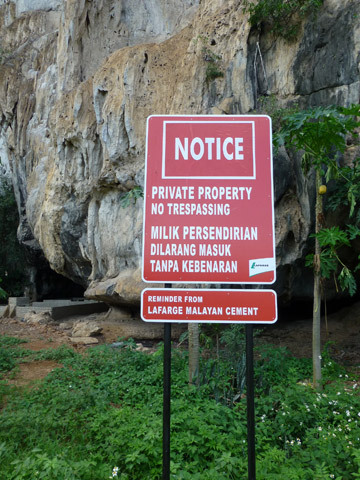 Lafarge Malayan Cement has placed warning signs at the Kanthan cave entrance and around the hill. Photo by: Liz Price. One reason why few people care about threats to cave-dwelling animals is that most of them are not exactly cuddly: spiders, snails, snakes, millipedes. According to Liz Price, an expert on caves of Malaysia, few people are concerned about endemic fauna on the hill. “It’s almost impossible in Malaysia to save anything! Even big mammals are suffering from poaching, so of course no one cares about ‘creepy crawlies’,” says Price. Another potential loser from this quarry would be the monks from a Buddhist monastery located at the base of the hill, near the cave entrance. 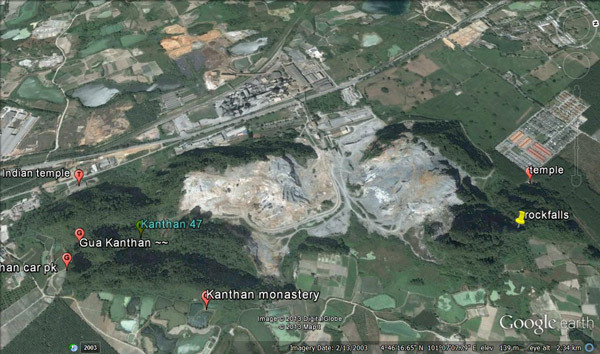 If the project goes through, the monastery, as well as nearby Taoist and Hindu temples will be completely destroyed. Monks and worshipers will be left out on the street. “The monks have given up their lives, so it is a bit difficult to leave,” a representative from the temple committee, who asked to remain anonymous, told mongabay.com. 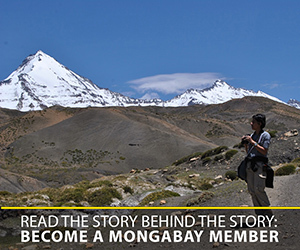 The representative added that Lafarge was in direct negotiations with the monks and had promised to come up with a “proposal” for the future of the monastery. No further details were available about what that proposal might contain. 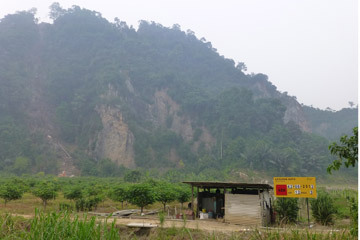 Kanthan hill in North Peninsular Malaysia is already extensively quarried. Further digging would destroy both the Kanthan cave and the monastery and temples in the hill. The locals – temple people, farmers and fishpond operators – have been given conflicting information about the future of the hill. Earlier this year, they were told that blasting would start on 1 June 2013 and that they should get out. But apparently in April, Lafarge stated that they would not move into that area until 2015. None of the blasting has taken place inside the cave or the monastery yet. According to the latest reports from the area, the local government has currently put the project on hold until an Environmental Impact Assessment has been completed. Nonetheless, Lafarge already owns the lease for the territory of the entire hill. Farmed land at the base of Kanthan hill with a sign warning about upcoming blasting by LaFarge. Photo: Liz Price. A 1999 World Bank report on limestone resources management suggests that sites chosen for cement quarries should be in areas that are already disturbed or degraded. Caves should be avoided because of the endemic species that likely live there. Such criteria are yet to be explicitly adopted in corporate policy. In 2001 Lafarge Malayan Cement was presented the Enterprise Governance Award for Green Initiative by the Malaysian Business and the Chartered Institute of Management Accountants. In an ambitious 2012 Sustainability Report, Lafarge states that it is working to “protect and promote biodiversity at its sites” among other promises for sustainability and corporate responsibility. With newly built housing and roads, there is an ever-increasing demand for construction materials throughout Asia. Innovative building materials made from recycled components could help reduce the pressure on already degraded and over-extracted natural resources. In 2010 Lafarge received Green Label Certification for two eco-friendly cement products manufactured using pulverized fuel ash, also known as fly ash, a by-product of coal-fired power stations. A small Hindu temple on the north side of Kanthan hill. Photo: Liz Price. Cavers explore the biodiversity in Kanthan cave while they still can. Photo: Bjorn Olesen. 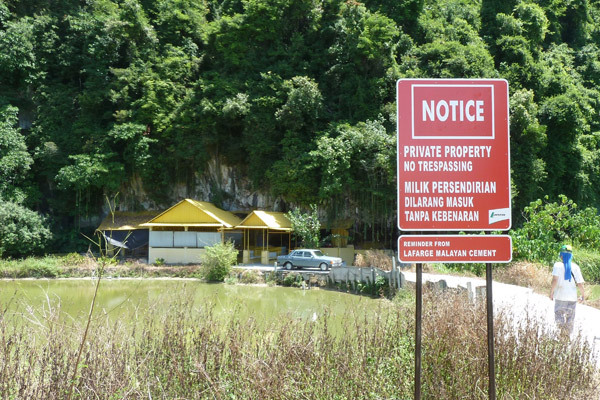 ‘No trespassing’ sign placed by Lafarge on the way to the Chinese temple in the base of Kanthan hill. Photo by: Liz Price. More information about a similar project in the region: Caving into Development by By Tan Cheng Li for The Star, Malaysia (16 July 2013). Kanthan Plant has maintained the necessary operating leases since operations commenced in 1964 (the latest lease and operating permit were granted by the relevant State Government ministries in 1990). Lafarge, through its Associated Pan Malaysia Cement (APMC), is the Registered Proprietor of the land in question. In order for the plant to maintain operations, it is intended to access the necessary raw materials from two other parts of the designated quarry. These are identified as Area ‘C’ and Area ‘D’, both of which are to the southern part of the Kanthan Hill. In line with the plant’s environmental management systems, a number of studies, including biodiversity and cultural impact, are being undertaken before exploration of these areas. The biodiversity study, conducted by Professor Dr Rosli Hashim, Head of Biological Sciences Institute, University of Malaya, has commenced and will be completed before the end of the year. Preliminary studies by the University has identified biodiversity sensitive areas in Area ‘D’ and further study of biodiversity management is required. This will continue to involve the University as well as Lafarge’s International Biodiversity panel. Based on the results of the study, best management practices will be put into place to ensure proper protection of endangered species, before any development in this area commences. From initial studies, it is believed that Area ‘C’ does not contain sensitive biodiversity, although a number of caves in this area have been used in recent years without permission. Due to the current location of quarrying activities and non-authorised access by third parties to land contained in Area ‘C’, signage has been erected for safety reasons. The plant is liaising with the State Government on understanding the use of these caves, as safety will become an increasingly important issue as operations progress in this area. 18 months of preparation work will also be required prior to accessing raw materials from Area ‘C’. Lafarge Malaysia has been awarded the SIRIM Eco label for its Phoenix and Mascrete Low Heat cement product within Malaysia, and in Singapore it received both Green Label and Green Building Product recognition. (05/29/2013) Scientists have discovered two new species of short-tailed whipscorpions (in the order Schizomida) in limestone caves in Brazil, according to a new paper published in PLoS ONE. The new species—dubbed Rowlandius ubajara and Rowlandius potiguara—add new knowledge to a group of arachnids that is little known in South America outside of the Amazon. (08/06/2012) Scientists have discovered what is likely a new species of cricket that is the top predator of its lightless world: a cave in a Venezuelan tepui. The fauna of cave was documented by BBC filmmakers as researchers uncovered not only a large, flesh-eating cricket but a new species of catfish. (02/22/2012) It’s not the prehistoric monsters from the Jules Verne’s Journey to the Center of the Earth or the human-bat hybrids of The Decsent, but it’s an astonishing discovery nonetheless: intrepid scientists have discovered the world’s deepest surviving terrestrial animal to date, a small wingless insect known as a springtail. Explorers discovered the new species, Plutomurus ortobalaganensis at a shocking 1.23 miles (1.98 kilometers) below the surface. The species was discovered by the Ibero-Russian CaveX Team Expedition in Krubera-Voronja Cave, the world’s only known cave to go deeper than 2 kilometers.